Stuffing meat is fantastic. Not only does it add extra flavor and texture but it takes advantage of Budget Byting Principle #2: use ingredients wisely. That means taking an expensive ingredient (the pork) and combining it with a less expensive ingredient (the stuffing) to bring the cost per serving down. The second trick that I used to make this recipe so cost efficient was the fact that I snatched up this huge 27 oz. pork loin when it was on sale ($4 off!!) and stored it in my freezer ’till I was ready to use it. Normally, $8.99 for a pork loin is just too expensive for my taste but slash it by almost half and I’m game! Lastly, even though dried cranberries and walnuts are by themselves expensive ingredients, if you use them sparingly to just add a little bit of “oomph” to the stuffing, they won’t do too much damage to your bottom line. 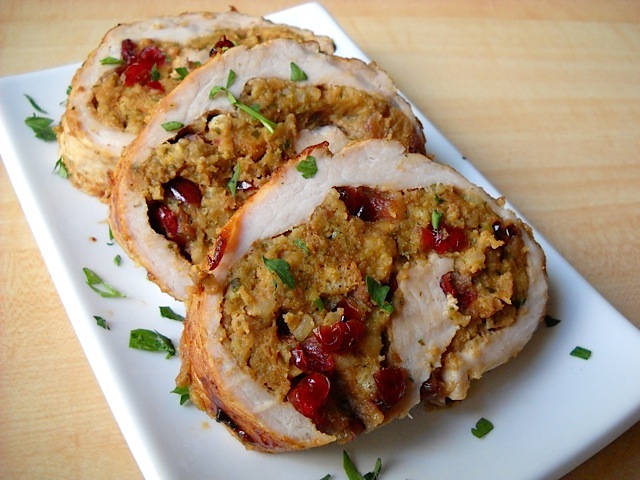 This Cranberry Walnut Stuffed Pork Loin may seem fancy, but it's actually pretty simple. Make something spectacular tonight! Preheat your oven to 350 degrees. In a medium pot, cook the stuffing according to the directions on the box (usually bring water to a boil with butter, add stuffing mix, remove from heat and let sit with a lid on for 10 minutes). My box suggested using 4 Tbsp of butter but I felt that was excessive so I used 2 Tbsp instead. Meanwhile, “butterfly” the pork loin in preparation for stuffing and rolling. Butterflying means cutting it so that it lays out flat in a rectangle instead of being in it’s usual cylindrical shape. Instead of taking step by step photos of this process (because I’m still honing my butterflying skills) here is a website with excellent photos and instructions. 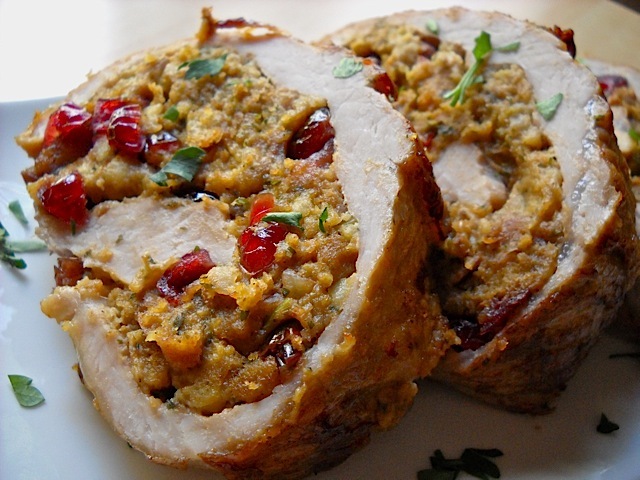 Mix the dried cranberries and chopped walnuts into the cooked stuffing and spread the mixture all over the butterflied pork loin. 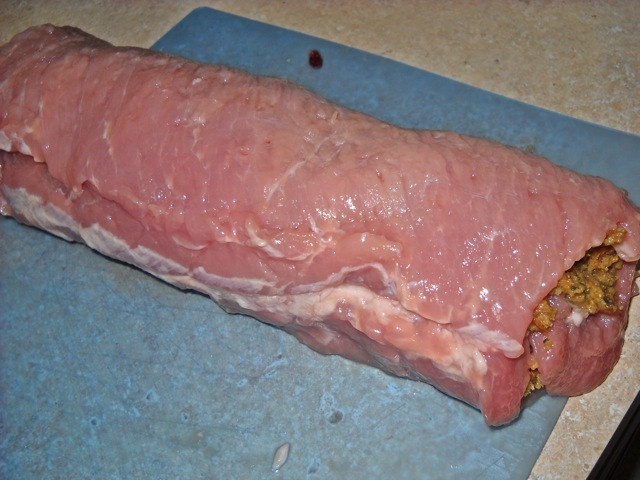 Starting at one of the long sides, roll the pork loin and it’s contents all the way up. Secure the opening either with a long skewer (thread it along the edge like a needle), multiple tooth picks or tie it up using kitchen string. Heat a skillet with 2 Tbsp of olive oil on medium/high heat. When the oil is very hot, sear the pork loin on all sides until it is brown and crispy. Transfer the seared pork loin to the oven (on a baking sheet) and finish baking until the internal temperature reaches 160 degrees (about 45 min). 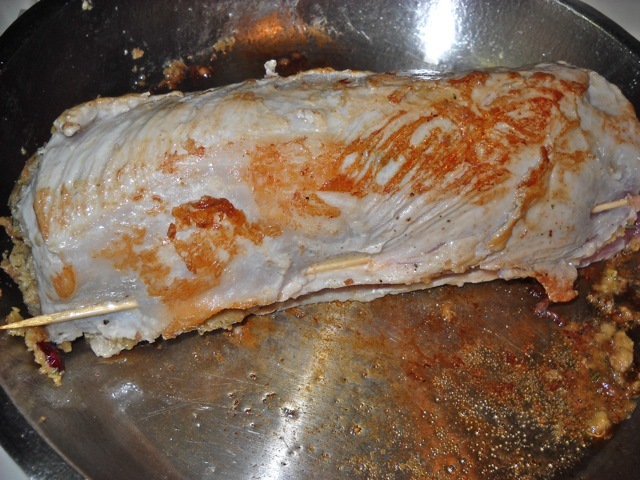 When the stuffed loin is finished baking, let it rest 15 minutes before slicing to allow the juices to redistribute into the meat. Slice the roll into 1 inch thick servings and enjoy! 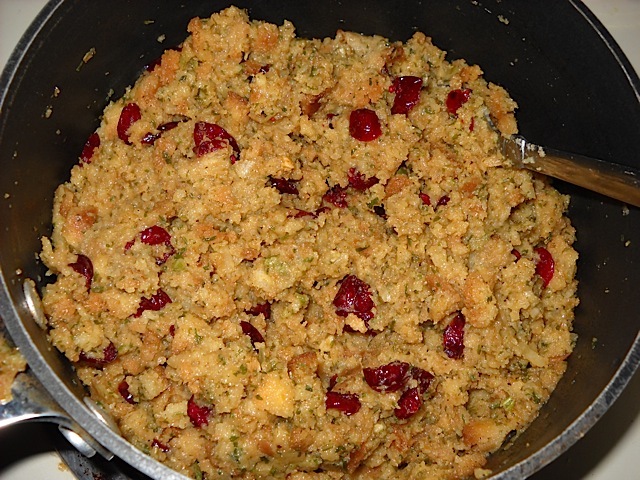 Cook the stuffing according to the directions on the box then mix in the dried cranberries and chopped walnuts. Butterfly your pork loin so that it lays out flat and is about 1 inch thick. Don’t worry if it is not perfect, mine definitely wasn’t!! 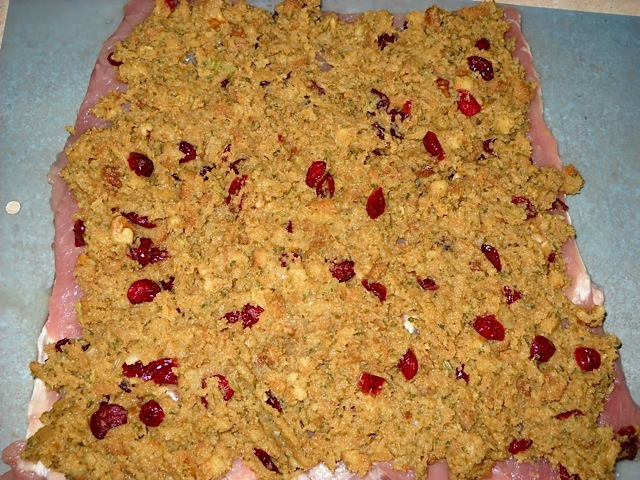 Spread the stuffing mixture out evenly over the pork loin. Roll that bad boy on up! If any stuffing tries to escape, just push it back in. Secure the opening on the roll with a long skewer, tooth picks or some kitchen twine. Sear all sides of the pork in a hot skillet until it is brown and crispy on the outside. 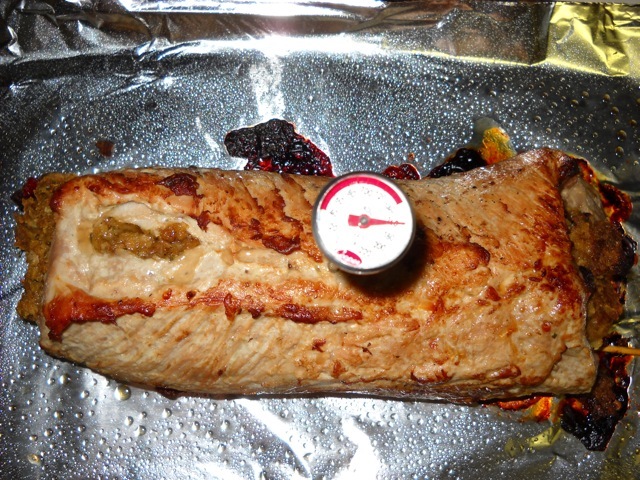 Bake the stuffed pork loin at 350F degrees until it reaches an internal temp of 160F… approximately 45 minutes (shorter for smaller pork loins). Let the pork loin rest for 15 minutes then slice into 1 inch thick portions. PRETTY! NOTE: Everything is always prettier and more appetizing when placed on nice plate and sprinkled with some fresh chopped parsley. Soooo, if you weren’t able to perfectly butterfly the pork loin then it pulled apart, shrank and tore open when it baked (like mine did), just gussy it up and no one will notice. Plus, it will still taste fantastic so everyone will be impressed! Great recipe. Cranberries add such a nice touch. 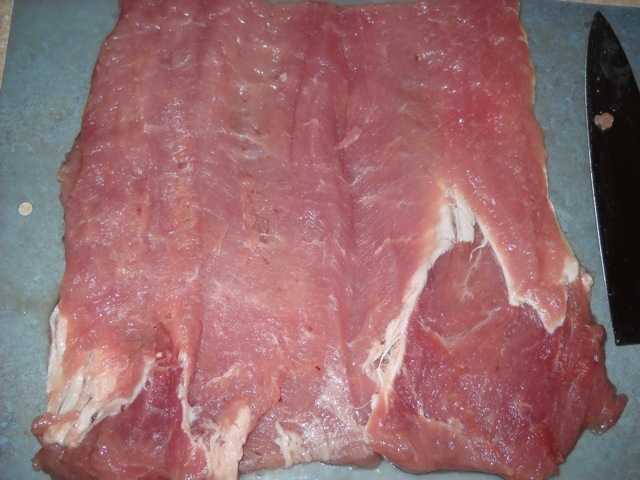 Subbed boneless pork loin steaks from Ralph’s on sale for $1.99 a pound. Very easy prep. Added a little Lawry’s seasoning salt. Find this website seems to lack seasoning.